Step 1 Prepare the asparagus: If it is thin, simply cut off the bases. If it is thicker than a No. 2 pencil, cut off the bases and peel, starting at the tips with light pressure and gradually increasing the pressure as you work your way down the stalk until you're pressing quite firmly at the base. Step 2 In a tightly sealed pot over rapidly boiling water, steam the asparagus until just tender, 2 to 3 minutes for thin asparagus, 4 to 5 minutes for thick. Drain, pat dry, dress lightly with 1 tablespoon oil, season with a pinch of salt and keep warm. Step 3Place the bread crumbs in a bowl. Season lightly with salt and thyme leaves and then add enough oil to generously coat, about 1 tablespoon. Step 4Transfer the bread crumbs to a small nonstick skillet and place over medium heat. Cook, stirring occasionally, until they begin to darken. When they have fried enough that they feel dry when you stir them and make a dry, static-y sound, 2 to 3 minutes, divide them into 2 equal batches and pat to make a thin layer. Step 5Crack the eggs over the bread crumbs. Season with salt and freshly ground pepper, cover tightly and cook the eggs until they're as done as you like (they are best with the yolks left runny; if you prefer over-easy, you can flip them). Step 6Divide the asparagus in half and arrange it on 2 warm plates. When the eggs are done, drape one egg over each asparagus bundle. Add the vinegar to the empty pan and let it sizzle for a moment before drizzling it over the eggs. Serve immediately. In Recipes-list.com we have selected the most viewed recipes from category - Breakfasts Main courses Quick and easy Vegetarian . Enjoy the best recipes specially selected for you! 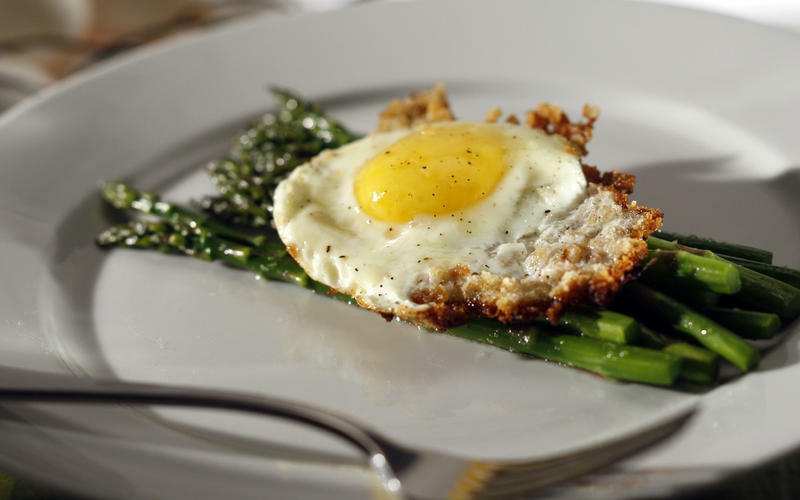 Asparagus with bread crumb-fried eggs is the right choice that will satisfy all your claims.